UNIC espresso machines are quite literary the workhorse of the industry. 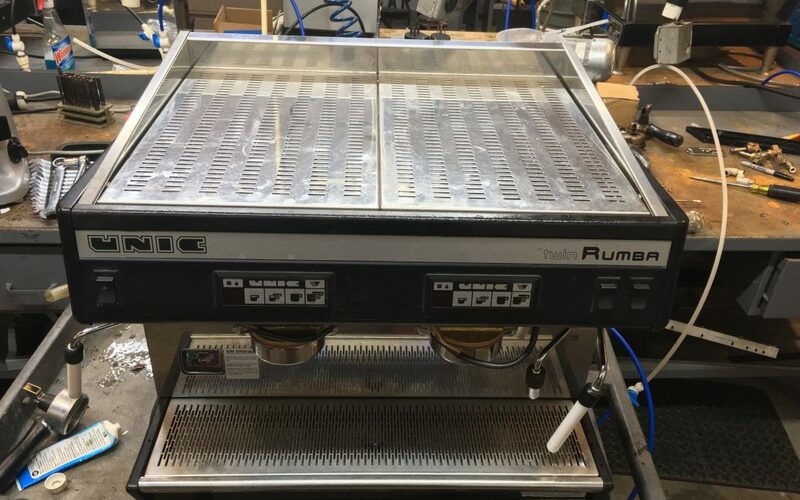 They are very reliable and easy to use, no fancy buttons or computer programing just a straight up espresso machine that keeps on delivering espresso shots and steams milk without a fuss. I will be highlighting about the UNIC from a service tech’s point of view. 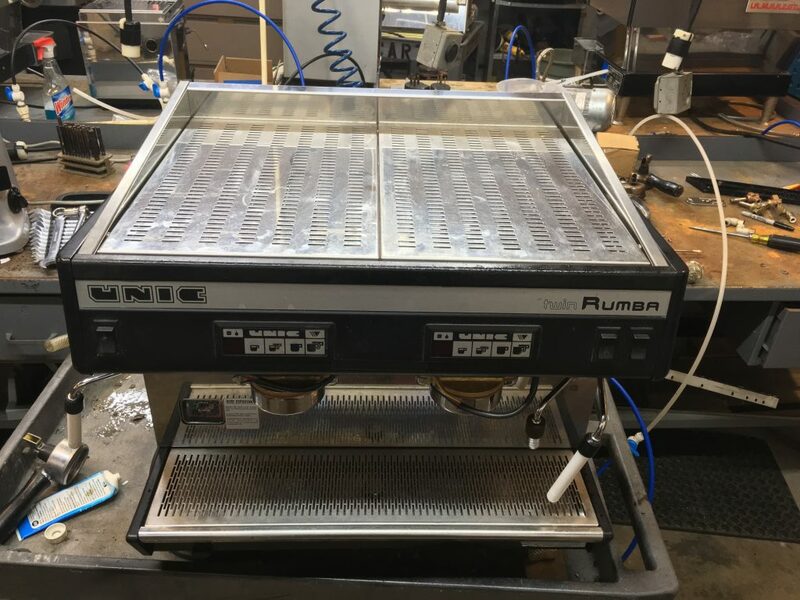 The UNIC is made in France and is sold through UNIC USA in Seattle WA, what makes the UNIC a treat for me as a service coffee tech is the simplicity of working on the machine. First off, the panels on this little gem is easy to remove, six screws on the top plate that holds the side panels and the top in place. Once they are removed the whole machine is opened up for easy access. The jet in the group head is very easy to get to as well, it is located to the right side of the group head and can be removed by a 21m socket wrench. Looking around the top you will see the hot water valve and the steam valve, in-between them is the computer box. To put the computer out of harm’s way you simple unscrew the bottom two screws holding the front plate on, pull it forward and then flip it over and the valves and water lines are there to work on. What is the biggest selling point for me is where the flowmeters and the inlet valve are at, in back with plenty of space to get your hands and tools in without busting your knuckles or burning your hands. There are only four or five valves in this machine that could give you problems, clean them and the jet you are generally home free and back at making espresso again. 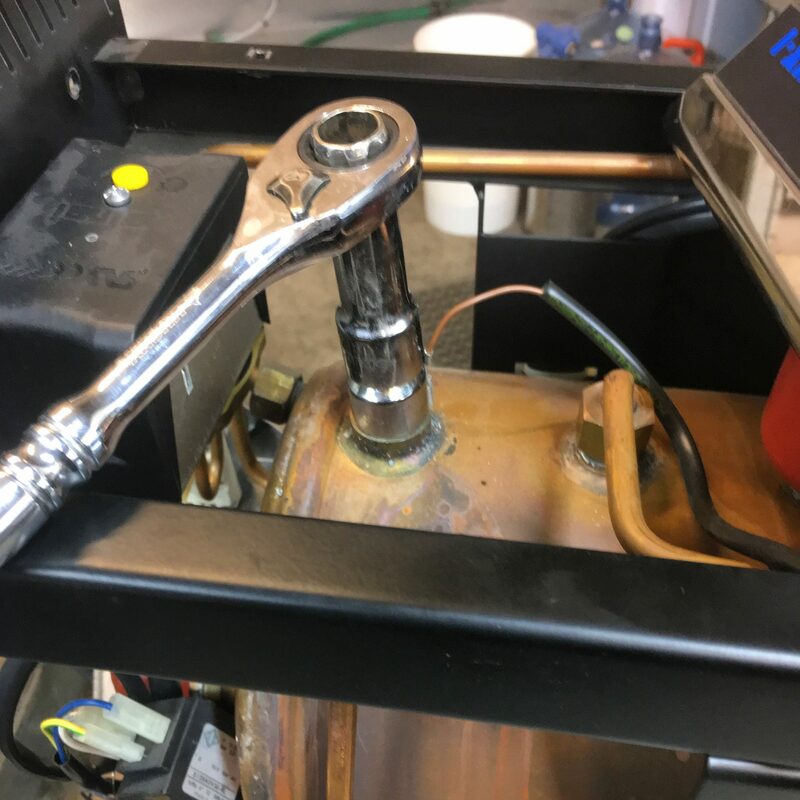 The heating element for the UNIC is also one of my favorite, it does not require a special wrench to remove, it is held in place by four bolts that are easy to find and remove. 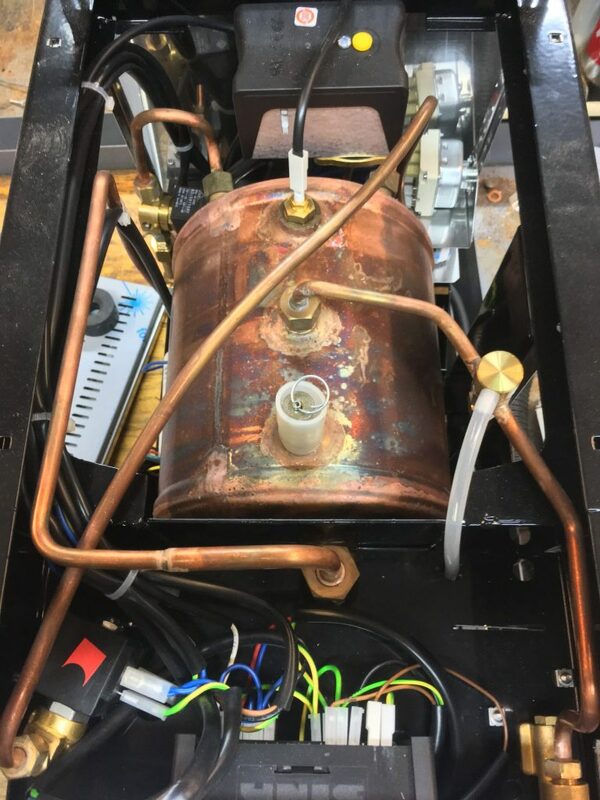 The boiler is a one boiler system with a steam chamber built inside, all made out of coppers so it will not pit or rust to develop holes that leak. The UNIC is truly a coffee technician dream to work on. For a coffee shop owner that has new help that is learning how to be a barista this machine will help them get on their way. The control box has two settings for espresso with a continuous pour button as well, so if your barista wants to make a short shot they can, the steam valve has a switch or lever so they can control the output in which they are steaming their milk and the same can be said about the hot water. The shape of the UNIC is very plain, not fancy or large but straight and cube like, minimizing the foot print and space needed on your counter, perfect for tight space in a coffee shop or in an espresso truck. Overall the UNIC is perfect for people who are starting out in the coffee industry and wants a machine that is affordable and easy to use and can also deliver an outstanding cup of espresso.